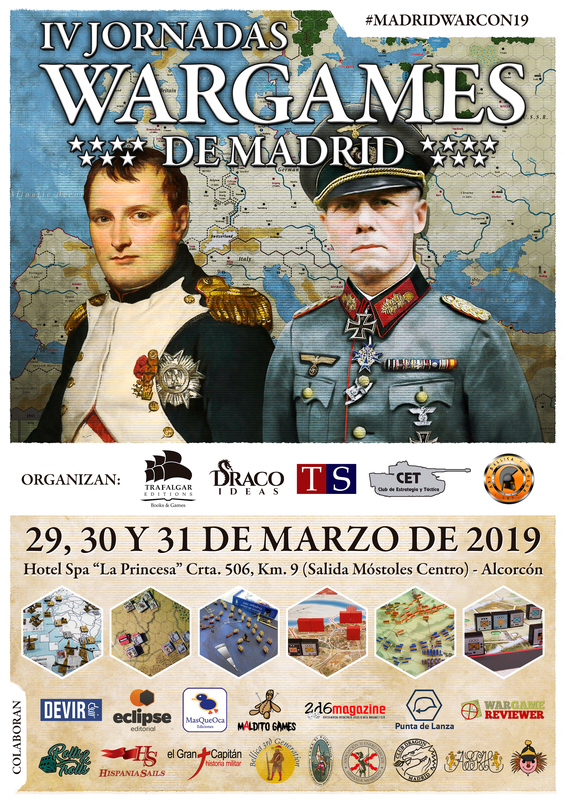 Trafalgar Editions and Draco Ideas organize the "IV days of wargaming in Madrid" to be held on 29, 30 and 31 March next at the Spa Hotel "La Princesa" in Alcorcón (Madrid). There will also be games and demonstrations of prototypes such as "Rally Set Up" or "Manager 4.4.2" among others. Very soon we will have more information about these days and about the activities that are waiting for all of you who plan to attend. As every year on Saturday we will enjoy a guild dinner among all the attendees who wish to attend (in the same hotel and on €15) go on this Excel Guild dinner. For those who want to spend the night at the hotel check prices and conditions. Friday: from 18:00 to 24:00. Saturday: From 10:00 to 24:00 (dinner on 21:00). Sunday: From 10:00 to 18:00. Space: This is a large room of 250m2 with 30 large tables with ample space for 6 players each. In total 180 players seated, which can be expanded. Activities: We will expand the activities to be organized, games, demonstrations, in this link, although they will not be reflected all of them. All stakeholders indicate in this direction what game and when you can play. We will also use this Excel for the activities of the clubs and associations that collaborate. Spa cycle of the hotel: for all those who wish, they can do the spa cycle of the hotel, which usually costs €25 at a special price of €15 courtesy of the hotel, for attendees, which lasts 75 minutes. For more information, call the hotel (902 35 32 52) with a timetable of 10-20h. This service is managed exclusively by the hotel (ask what you need to take and say you are from the days). Continental breakfast included, courtesy. When you book, say you're going to the board games. Double Room 1, Night: €70 VAT included. Double Room Pack Two nights: €120 VAT included. TRIPLE room, 1 night: €100 VAT included. TRIPLE Room, Pack 2 nights: €180 VAT included. Half-board supplement: €18 for lunch or dinner.